Tahiti Thatch - Top Cone - FREE SHIPPING!!! Pieces of hardy desert palm leaves are bound together along the top of the panel. Tahiti Thatch Panels are available to finish off a circular structure. * Tiki Shack Tahiti Thatch clips are used to attach directly onto Tiki Shack umbrella frame for a full tropical shade. * Very quick and easy to install - no special tools or skills needed. * Thatch top cones can either be tied to 8mm (1/4") steel rods of an Tiki Shack Umbrella frame or nailed or stapled to wooden battens. Can I install the Tahiti Thatch Top Cones directly onto an existing roof? Absolutely, however we do recommend you attach a wooden lattice made of horizontal then vertical firing strips to the roof first. This allows ventilation and drainage around the thatch which increases the longevity of the product if it is able to �breathe�. Can you suggest what I should use at the top of my umbrella? Tiki Shack supplies the Tahiti panels which match the Tahiti Thatch Top Cones. This is a great way to finish off the structure giving the umbrella an island flare. Can the Tahiti Thatch Cones be fire retarded? Yes. 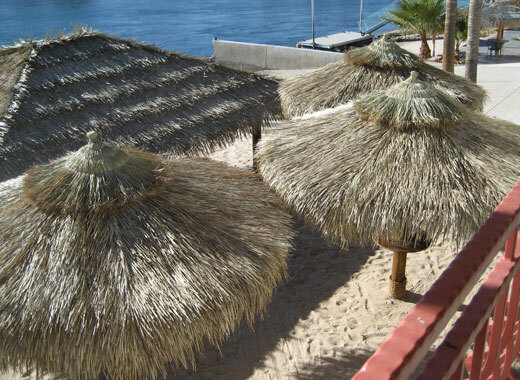 In order to receive a Fire Retardant Certificate for your Fire Marshal, Tiki Shack can either pre-fire retarded the Tahiti Thatch Panels to a class A rating and then ship, or our applicators can fire retard your structure on site after thatching is complete. If you choose to apply the fire retardant yourself, this can be purchased from Tiki Shack Importer but we would not be able to issue a certificate.